It's hard to believe that another year has past and it's time for the 2019 Buddy Walk already! Thomas has had an amazing year and continues to amaze and surprise us every day! He absolutely loves school and has made some truly amazing friendships this year. Outside of school, Thomas has been involved in ballet through the Cincinnati Ballet, swimming lessons, and will be starting soccer soon! 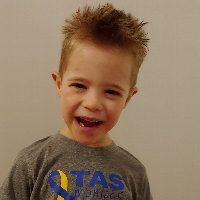 We hope you'll help us honor Thomas (and others like him) by supporting us or by joining us at this year's Buddy Walk on September 7th down at Sawyer Point in Cincinnati! The pre-party starts at 9am, with a walk starting at 10am, followed by free food and festivities for the whole family!